Small events have a lot more flexibility when it comes to opportunities with venues, activities, and interaction. In the end, it is simply easier to work with the needs of a smaller group. Of course, planners still need to get creative if you want the day to flow well. A checklist of important details helps the flow of the event, and gives valuable insight into what can work better next time. The best ideas begin with a solid foundation, so it is important to set up the framework of your event before looking ahead too far. Things like dates, times and itineraries should be completed before moving on to any intricate details. Be sure to utilize the many free apps and programs used to track dates and necessary calls. You’ll have an easier time finding a room for a smaller group, but the capacity thresholds will be tighter. If your event expands from 50 people to 100, you might have to move to a larger room depending on the capacities of your venue. Generally speaking, it is easier to go smaller in a pinch, so shop for a room that can accommodate your largest attendance projection and scale down as needed as long as it doesn't affect the budget. Even if you are hosting a “free event” you still need to present it in a way that entices registrations. People want to know how they will benefit from attending the occasion, and the way you word your invitations and marketing materials can have a big impact on whether or not they will show up. While your event likely sounds exciting to you, the real challenge is getting others excited as well. The one downside to small events is that they typically cost more per person because hotel and catering prices decrease as quantities increase. To make matters even more complicated, a 20 percent drop in numbers for a small event has the potential to affect your group pricing status. With that in mind, you want to budget costs per person under the lowest projected attendance figure. If you do this accurately then your profit margin will actually increase for each person you add over the projection. Small groups offer more opportunities for organized discussions, so use this to your advantage when planning the itinerary. 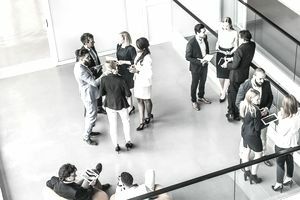 It is not much fun to be “talked to” all day, which is why many small events offer group sessions or breakout options. Even group projects can be integrated under the right circumstances. Think of ways to get your attendees involved with the dialogue as this will increase their retention rate of each presentation. The best way to get a jump on planning your next event is to listen to feedback from your current one. Leave plenty of time for questions at the end of each segment. You can also stage questions from your staff in order to get the conversation started. Feedback forms are easy enough to include in your information packets, but make sure you instruct attendees on how you want them submitted. A good networking function can add tremendous value to all of the participants. If you were effective at spurring dialogue between attendees then everyone should know a little something about each other by the end of the day. It always helps to make food available at a function like this, and you may even want to recruit commitments before the day of the event. As they say, nothing draws a crowd like a crowd, so be proactive in promoting all post-event functions. Small events have the potential to be a rich and rewarding experience for everyone, but you do need to plan each minute with the audience in mind. The good news is that it gets easier every time because you’ll understand precisely what your guests are hoping for.